Maven Optics is a fairly young company and has only found traction in the industry, starting in the last couple of years. Do not let the lack of exposure fool you, these guys know what they are doing! The overall mission of Maven is to provide high end optics at very competitive price. How they go about doing this is by removing a few un-necessary parties in the sales and distribution process. 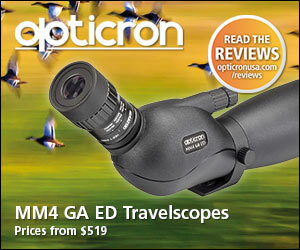 The purchase of their optics can only be done through their website, which in turn saves everyone money. The other great value they bring to the table is making custom binoculars a capability, which can be accomplished 100% on their easy to use website. I have only heard good things about customer’s experiences with Maven… and this was also the same for me. The design and overall tactile feel of these binoculars, is very impressive. The B2’s texture has a smooth rugged feel and are well balanced, making them easy to use. 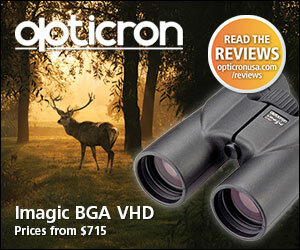 The material used in the production of these binoculars is very high end. The frame is made from magnesium and is durable, especially where that binocular straps attach to the frame. What I loved the most about these binoculars was the eye cups. I do have to mention the focus wheel, at first I felt it was a little jumpy but after I got used to it, I was able to keep a crisp and focused image picture. I found that the eye relief and adjustment seems to fit my eyes perfectly, this makes twelve hours of glassing much easier on the eyes. 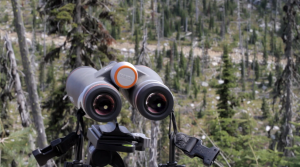 I was able to test the Maven B2’s on a spring bear hunt in the panhandle of Idaho. I knew these binoculars would more than likely be up to the task, but how would they compare to a similar priced and more battle tested competitor – the Leica 10×42 Ultravid HD Plus Binocular. I was able to get my hands on a pair to bring along. Unboxing the Maven B2’s was a fun experience. They come in a well-designed and once again, tasteful tactile modern display box. The Maven Raven logo is the first thing you see and it really adds to the experience. The box is stamped with the approval of Lander, Wyoming –USA, where Maven’s corporate office is located. The B2’s that I ordered, arrived two days before we left for Idaho. This gave me enough time to familiarize myself with the binoculars as well as find the proper parallax focus for my eyes. I immediately knew that I would enjoy using these to find a brute of a black bear in the wild country we were heading for. Having gone the year before, I knew how much time we would spend behind our optics in search of bear. This year proved no different, in fact I believe I spent a lot more time behind the B2’s than I would have with any other binocular. Nothing makes hunting better than the friends and family you share your experiences with. Two of my best friends were headed to Idaho with me and I will talk about them in this review. Their names are Tanner and Jon. 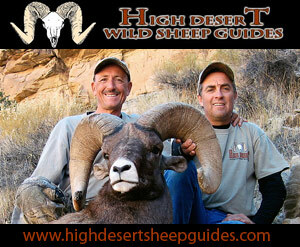 We have been on countless hunts together and there is always a healthy mix of fun, frustration, and impatience. I was able to put the B2’s to use the very first day we rolled into the area. As soon as we set up our base camp, we took off to a good glassing point where we had seen a bear the year before. When we had made it to our vantage point we immediately knew things were a little different from the year before. There was a lot less snow. This was going to make finding bear a bit more difficult in this vast terrain, as there was food (green grass) everywhere. We did not see our first bear until the second morning of the hunt (Monday). From the old logging road we were glassing, the bear was over two miles away. The Maven B2’s made getting a good view of this bear easy work. Even in low light I was so impressed how clear the glass was. I couldn’t take my eyes of the bear. The bear seemed to be a good sized bore, with a perfect jet black coat. The bear seemed to be feeding uphill in a perfect clear cut, however we needed to close some serious distance before we could even start dreaming of taking a shot. We ran as fast as we could trying to get into position, but no matter what we did we could not see through crazy thick timber. We tried position after position and we never saw the bear again. Man this was so frustrating! Tuesday I spent around eleven hours behind the B2’s. I was so impressed how my eyes agreed with the eye cups and relief. I would be lying if I did not say my eyes were tired by the end of that day, they were straight up exhausted. 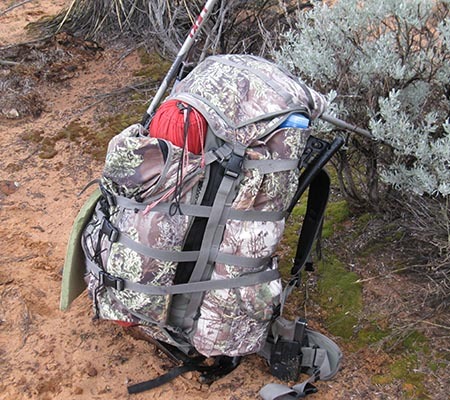 “Spot and Stock” bear hunting is so much fun, but at the same time very difficult. That day we did not end up seeing any bear until the last hour of daylight. 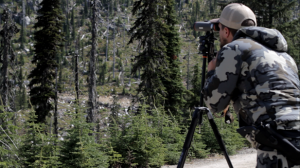 My friend Jon spotted most the bears that evening (we ended up seeing four different bear and we couldn’t make it happen on any of them) and worked with me to get into position for a shot. He was over a mile away directing me where the bear was. Once again this was another large bore with a black coat. I hiked until the last sliver of light trying to get a glimpse of that bear. Once again NO LUCK! The bear were not holding remotely still. I was frustrated and tired of not seeing much success, for the time we had put in. Jon had an opportunity the day before at a decent bear only 300 yards off the main trail. However, just like our luck had played out many a times before he took the shot and missed. I say luck because, Jon had taken a spill earlier that day and bumped his gun ever so slightly. We both agreed it was not enough to cause problems with his scope, but we were so wrong. After Jon missed the bear completely, we fired off a few shots to see how the zeroed the gun was. Well it was hitting about three feet to the left at 200 yards. On the second to last day of the hunt, Jon and I were working our way across a steep side hill. Our spirits were low, especially my own. All of the sudden, across the canyon I picked up some movement going through the oak brush. I immediately knew it was a bear! Sure enough as it passed through open spots in the brush I verified it was a huge bear. Jon stayed put to keep an eye on the bear while I moved across the hill to get into position to take a shot. I hurried into position and got my gun set up. I then ranged the bear, it was 330 yards with a one degree angle. I was so excited I could not believe it. Success was finally going to happen! Just as I was steadying my breathing, getting ready to pull the trigger I heard Jon yell DON’T SHOOT! I thought to myself, what happened? As I turned to look at Jon, super confused and very frustrated I heard him say there are two cubs with the bear. Turns out it was a giant sow black bear with two awesome cubs. The little ones had been hanging out behind her a ways, and came out literally at the last second. On this hunt I was able to do a lot of comparisons between the Maven B2’s and the Leica Ultravid. The 10x42mm Ultravid’s were noticeably lighter and smaller. For some, this would be very beneficial but for me I preferred the 11x45mm, which provided a noticeable difference in useable light. It also provided one more power of magnification. For me this did make a big difference when the name of the game was “Spot and Stalk”. When it came down to glass clarity, not using fancy lasers to test the glass and just using my eyes viewing a specific sight picture, I could not tell a difference. Given, each binoculars had different colors that somewhat “popped” too my eyes. The glass of the Leica seemed to provide a lot more blue/green hues, and the glass of the Maven B2’s white and yellow colors seemed more noticeable to me. The only time this was extremely noticeable, was in significant low light. Being able to see all the colors of nature, instead of a foggy blur, this gives you the edge needed to see everything on the mountain. The light the B2’s allowed through the lenses seemed to be a lot less tasking on my eyes compared to the spectrum of light that was visible through the Ultravid’s. Also, like a said before – the shape and size of my eyes fit perfectly with the design of the eyecups on the B2’s. The final feature that tipped the scales for me would definitely be Maven’s Unconditional Lifetime Warranty. This makes an important difference to me as I tend to be fairly rough on my gear, while out on the mountain. It is not like I plan to use my binoculars to kill a game animal, but sometimes they take a beating in the process of making things happen. You gotta get the word our Maven! I love mine! When I am out and about, I rarely talk to anyone who has heard about this great company and products.